We are looking forward to Shirley and Graham Holland’s Quiz Night in the Mayfield Memorial Hall on Saturday 30th January at 7.30 pm. We shall provide a hot supper with a dessert all for the price of £8.50 a head! Tickets will be available at The Shopping Basket and Burnett’s Estate Agency from 4th January. Alternatively contact Jenny Beaupain 01892 853161. On Saturday 5th March at 7.30 pm in the Mayfield Memorial Hall we shall be hosting an evening of Supper and Songs from the Shows. The renowned Tunbridge Wells Amateur Dramatic Society will be singing songs from their repertoire (e.g. Carousel, Gilbert and Sullivan, Sunset Boulevard, Sound of Music, Jesus Christ Superstar). Further details will be provided nearer the time. Two of the new sweeps! For a donation of £10 your signature on a shutter will be displayed on the windmill roundhouse in perpetuity. A shutter is available for signing in St Dunstan's pharmacy, Mayfield and in The Courtyard Cafe in Rotherfield. Our team of volunteers are continuing to do an excellent job on site. If you would like to join our friendly team then please contact us. Great progress is being made by our team of volunteers with the installation of the weatherboarding. 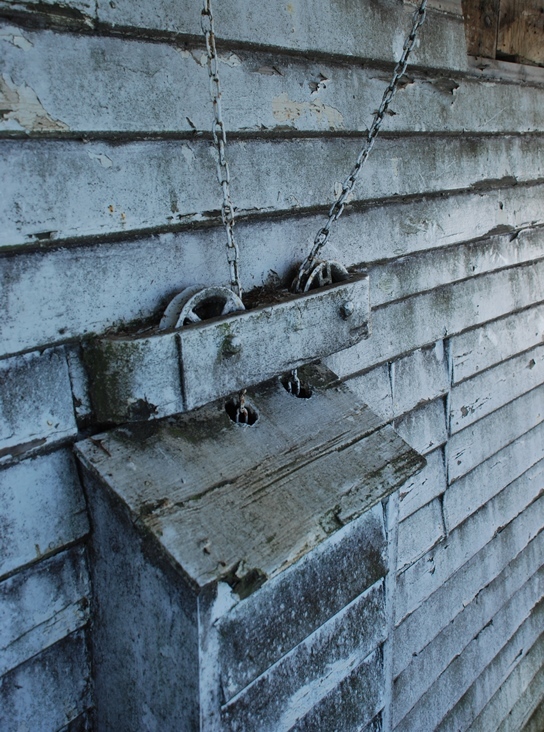 Here is a photo of the newly installed striking chain box. 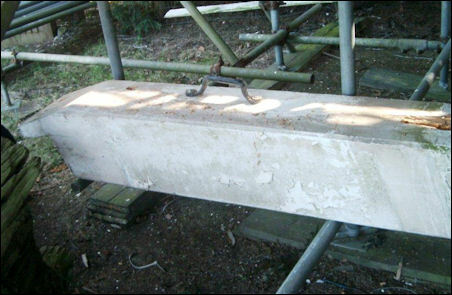 The photo below it shows the box prior to restoration. We are holding a fundraising bring & buy sale and coffee morning on Saturday 27th June in London House on Mayfield High Street, starting at 10am. Please come along to support us if you can! There is a lot of work to do on the mill over the spring and summer, including installing weatherboarding, repairing the roof, and repairing the roundhouse. If you are able to help and would like to join our team of volunteers then please contact us. 9th February 2015 We are hugely grateful to Audio Gold for their kind donation of £292.11 to the windmill restoration fund. Argos Hill Windmill is featured in a new short film highlighting the work of the AHF, and some of the buildings they've helped to restore. We have been nominated for the Courier "Heart of the Community" awards! The Kent & Sussex Courier have teamed up with AXA PPP Healthcare in Tunbridge Wells to hand out a total of £10,000 to good causes. Voting is already well underway and closes at midnight on Sunday 12th October. Please help support Argos Hill Windmill by voting for us either by collecting coupons from the Courier paper or voting by text. Full details are available here. Our voting code is: 1021. Many thanks for your support! 27th September 2014 Last Saturday it was the Rotherfield Millenium Green Trust Open Day where we had an Argos Hill Windmill stall to promote the restoration project in the local community. Luckily the rain stayed away and a great day was had by all! The event was well attended, with much interest shown in our progress at the Windmill. Margaret Cooke volunteered to run the stall with John Richardson (both on the Friends Committee). 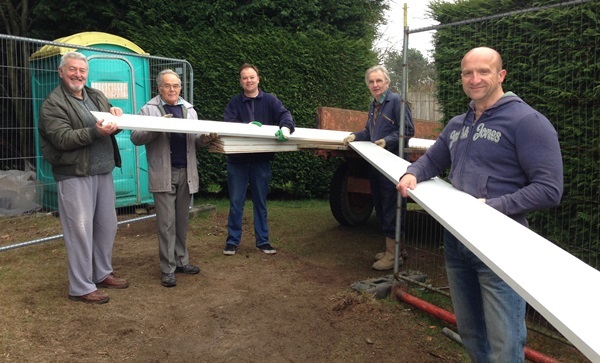 They did a great job and their help was greatly appreciated by all those involved in the Windmill. 27th September 2014 Last weekend was also the annual Mayfield Bonfire Society Torchlit Procession, where Mayfield village is lit up with torches, music and an array of costumes. After receiving a generous donation from the Bonfire society last year, we this year joined the procession ourselves. It was a fantastic event and was a great way for us to raise the profile of the Windmill further. Jenny Beaupain and Jane Driscoll lead the way with our banner and torches, dressed appropriately in their smocks! 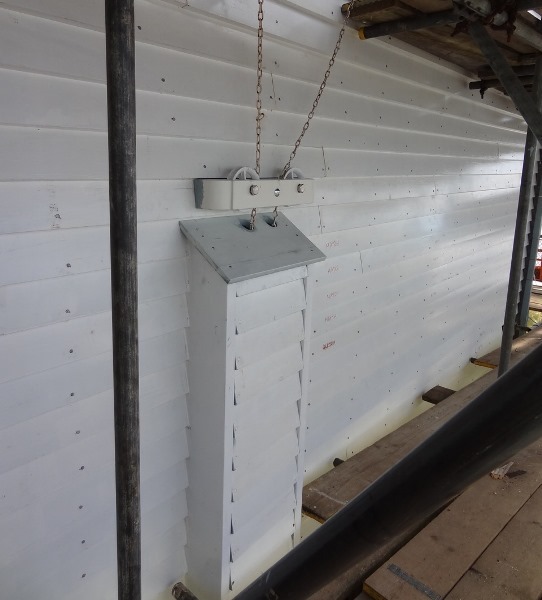 25th July 2014 The restoration is progressing well - the millwrights are working on the repairs to the main structural timbers on the left-hand side of the mill, while our team of volunteers is making excellent progress with painting the new weatherboarding. 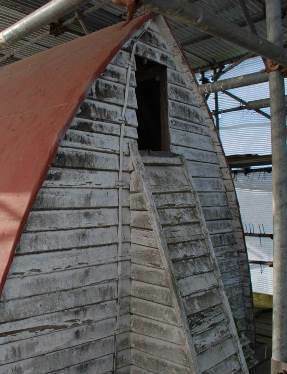 - The scaffolding around the mill has been adjusted and fully weatherproofed. 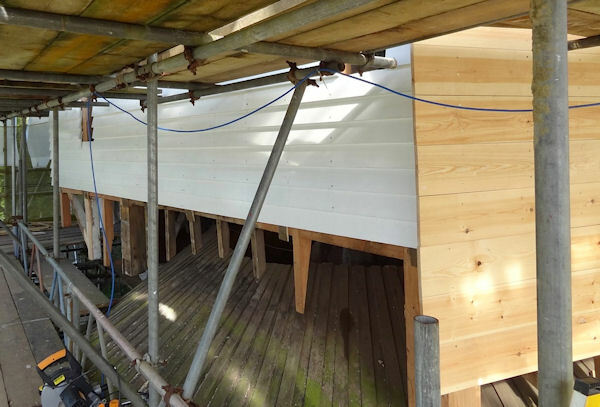 - The weatherboarding on the east side of the mill has been removed, so that the main timbers can be analysed. - The stock stubs have been removed from the windshaft canister. Following a recent competitive tendering process, we have now appointed a millwright to conduct the first phase of restoration. The millwright will be starting work on site next week. This represents a major milestone in the restoration project and we are looking forward to making significant progress over the coming months. 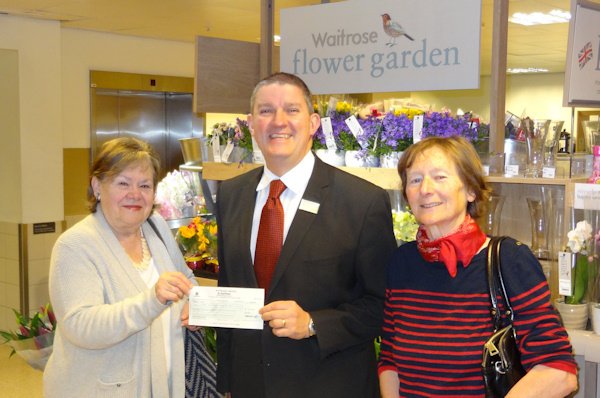 16th May 2014 Argos Hill Windmill Trust has received a cheque for £377 from the Waitrose "Community Matters" scheme. Many thanks to Waitrose and to everyone who placed green tokens in the Argos Hill Windmill box at the Crowborough store. The photo below shows Jenny Beaupain and Jane Driscoll collecting the cheque on behalf of the trust. We are delighted to have received a donation of £2,000 towards the Argos Hill Windmill Restoration Project from The Rotherfield Trust. An incredible week for fundraising! - £23,000 from the Architectural Heritage Fund's "Challenge Fund for Historic Buildings at Risk", which is backed by the Andrew Lloyd Webber Foundation and English Heritage. - £3,000 from the Charles Hayward Foundation. - £150 from CGI's charity committee. We are incredibly grateful to these organisations for their grants. They will have a huge impact on the restoration project. 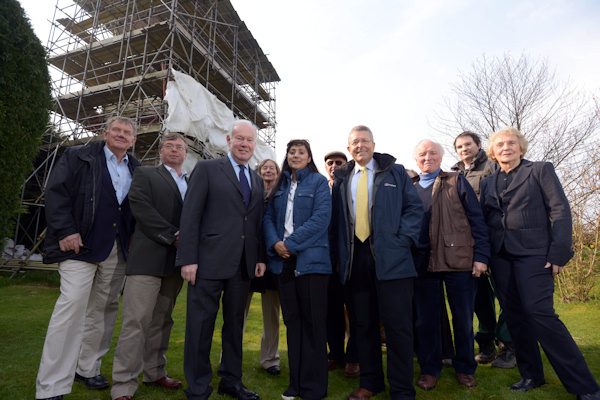 Charles Hendry MP visits Argos Hill Windmill. 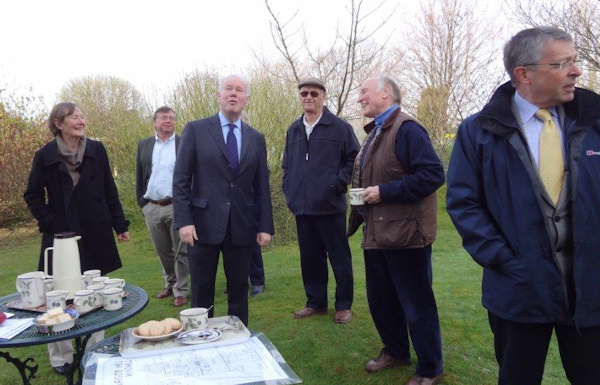 We were delighted to welcome Charles Hendry to the Mill on Friday 28th March. He was very interested to hear all about our progress to date and to learn our plans for this historic building’s imminent renovation. He was so keen that he even climbed up to the top of the scaffolding! We were pleased that Nusrat Ghani, the new Conservative candidate for Wealden, was able to join us. She also showed great enthusiasm for our restoration project. In addition to Mr Hendry and Ms Ghani, we were joined by Cllr Graham Wells (WDC), Cllr Jerry Watkiss (Chairman, Mayfield and Five Ashes PC) and Cllr Les Pike (Chairman, Rotherfield PC). In all, a very enjoyable occasion and an opportunity to celebrate our Heritage Lottery Fund Award with some of those who have supported us over the last few years. From left to right: Jane Driscoll, Cllr Jerry Watkiss, Charles Hendry MP, Cllr Les Pike, Derek Greenwood, Cllr Graham Wells. WAITROSE (Crowborough) GREEN TOKEN SCHEME - MARCH 2014. We will be one of the chosen charities to benefit from the Waitrose ‘Green Token’ scheme during the month of March. You only need to buy one item to qualify for a token so please support us by popping into Waitrose if you are in Crowborough. George Thomson successfully completed the Tunbridge Wells half-marathon on Sunday in one hour and fifty-five minutes. 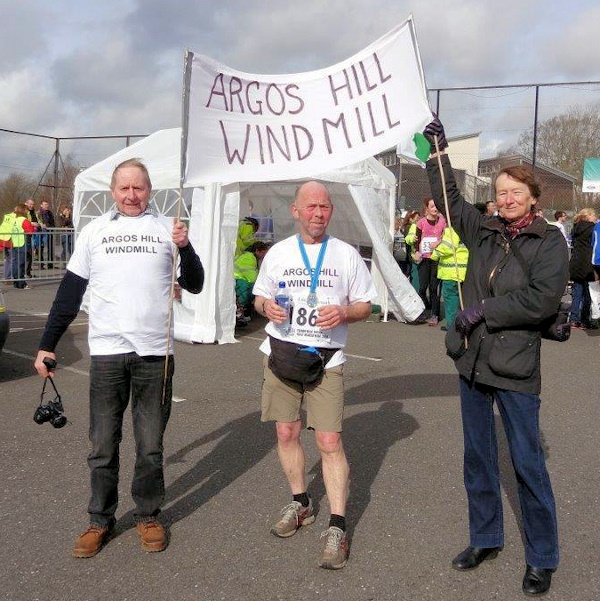 George was running in aid of the Argos Hill Windmill restoration project. Congratulations to George for a fantastic result! George Thomson has kindly volunteered to run in the Tunbridge Wells half-marathon in aid of our restoration project. George is a long-time resident of Rotherfield and can often be spotted running along the lanes near the Mill with a couple of dogs in tow. He will need to train hard as the Tunbridge Wells route is very hilly. You may sponsor him at three local shops: Leppard Butchers and The Shopping Basket in Mayfield and St Denys Pharmacy in Rotherfield or you may donate to the cause on our website. Alternatively, you may prefer to email your pledge to us and donate when the run has been successfully completed. We are delighted to announce that we have been awarded a grant of £100,000 from the Heritage Lottery Fund! For further details please see the official press release. We will be holding a Race Night on Saturday 1st March at Mayfield Memorial Hall, to raise funds for the mill restoration project. Race cards are available from Andrew Burnett in Mayfield or by telephone: 01892 853161. We are extremely grateful to the Mayfield Bonfire Society for their donation of £250 towards the mill restoration fund! Argos Hill Windmill will feature on the BBC1 TV show "Restoring England's Heritage" on Thursday 5th December at 19:30! 29th September 2013 Some dates for your diary! - 26th October 7.15 for 7.30: BARN DANCE in the Memorial Hall, Mayfield. Tickets £8 each or £20 for a family ticket of 2 adults and 2 children will be available from 1st October from Andrew Burnett, Estate Agents, High Street, Mayfield and from Pin Ups, High Street, Mayfield, or anytime by telephone 01892 853161. - We hope to have 2 runners in the Tunbridge Wells Half Marathon on March 3rd 2014 running in our T shirts, so if you are planning to run and as yet haven't organised it and/or would like to help please get in touch. 11th August 2013 Can you help? We are looking for volunteers to help man the barriers at the Mayfield Carnival on Saturday 21st September from 18:30 - 23:30. In return for providing this service for the Mayfield Carnival we will receive a donation towards the mill restoration fund. 5th June 2013 We will be holding a fundraising "Tennis Tournament and Hog Roast" event on Sunday 30th June at Post Mill House, Argos Hill Lane, Argos Hill. The Trustees and Friends of Argos Hill Windmill would like to invite you to join in a game of tennis or two to raise funds for Phase 2 of the restoration. All are welcome, singles, doubles and spectators in a knock out tournament on (perhaps) the most panoramic tennis courts in East Sussex at Post Mill House and the Mill House. Or just come along to support this fund raising venture and enjoy a glass of wine and hog roast in idyllic surroundings. There will also be a raffle and prizes. 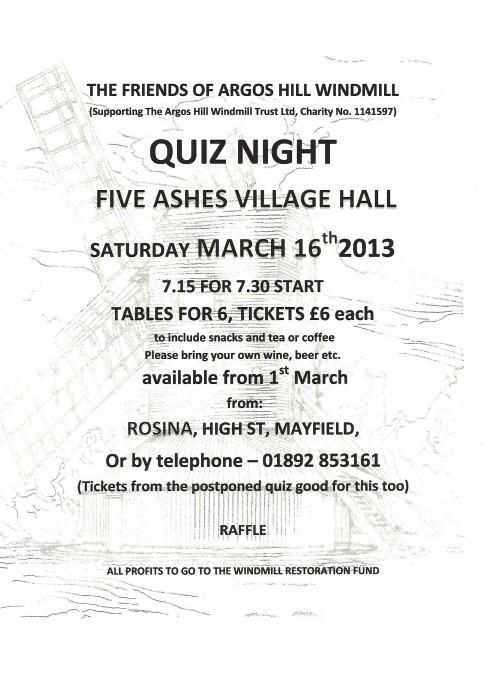 21st February 2013 The new date for our friendly QUIZ in aid of the mill restoration is 16th March again in the Five Ashes Village Hall, 7.15 for a 7.30 start. We were very sorry to have to postpone January 10th at the last moment but in view of the severe freeze it really was necessary. Should anyone who already has a ticket find they cannot make this new date please get in touch for a refund. Tables are for 6, tickets cost £6 each. As before there will be snacks and tea/coffee during the break but please feel free to bring wine, beer or whatever you like. The tickets will be available from 1st March from Rosina’s in Mayfield High Street or by phoning me – 01892 853161. 21st January 2013 We were very disappointed to have to postpone our quiz night on January 19th at the last minute. We were concerned about the icy car park at the Five Ashes Village Hall plus the very cold weather. We will rearrange the quiz night as soon as we are able, and thank everyone for their support. It would have been a super evening, and we will let you know soon the details of the new arrangements. If you are unable to manage the next date, or would like to be reimbursed please ring 01892 853161. 7th January 2013 Our fundraising Quiz Night is taking place on Saturday 19th January at the Five Ashes Village Hall. 7:15pm for a 7:30pm start. 19th December 2012 We are delighted to have received a grant offer of £2,386 from the Architectural Heritage Fund's 'Cold Spots' scheme for industrial heritage. 19th January 2013: Fundraising quiz night at Five Ashes Hall. 7:15pm for a 7:30pm start. Tickets available from Jenny Beaupain: 01892 853161. 17th April 2013: Friends of Argos Hill Windmill AGM at the Mayfield scout hut. 8pm. 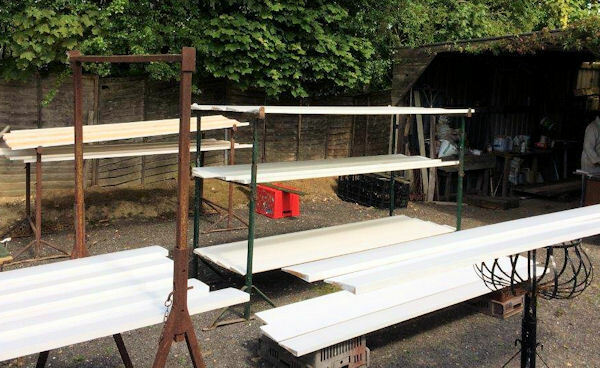 12th November 2012 A request for help... does anyone have a barn near Argos Hill that we could use to prepare and store the new weathboarding for the mill? 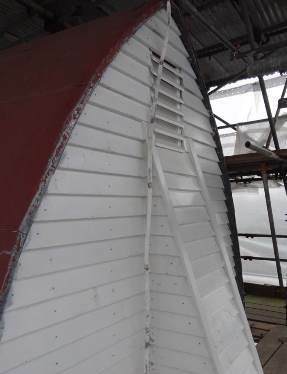 We are also looking for volunteers to help cut and paint the weatherboarding, and to help with fundraising. Any help is much appreciated! Please contact us if you are able to help in any way. 15th October 2012 We're very pleased to report that the installation of the steel frame to support the mill body has been completed! 13th August 2012 Work continues on site! Preparation work has started for the installation of the steel frame which will support the mill during the restoration. Holes for the supporting four bases have been dug, and the concreting work is expected to start this week. 26th June 2012 We are incredibly grateful to Mayfield Parish Council and Rotherfield Parish Council for their recent grants towards the restoration fund of £500 and £1000 respectively. 17th June 2012 Thanks to everyone who came along to our "A day in the life of a working dog" event on 13th June. It was a very successful evening and we are pleased to say that over £500 was raised towards the mill restoration fund. Special thanks are due to Kate Moore and Neil McEwan from the British Transport Police Dog Section, and to everyone else who helpded to run the event. 14th May 2012 We have arranged a fundraising event "A day in the life of a working dog" to take place on Wednesday 13th June at Rotherfield Villiage Hall. 7:15PM for a 7:30PM start. Tickets are £7.50 each (with a glass of wine) or £5.00 each (without wine), with all profits going to the restoration fund. Tickets are available from Rosinas in Mayfield, Rotherfield Post Office and Cuckoo Line Stores Rotherfield. Or phone 01892 853161 for more details. Please support this event and help raise vital funds for the windmill restoration. 12th April 2012 The severely rotten tailpole has been removed from the mill. It was not an easy task - it took over 20 hours work for volunteers Alain Beaupain and Jim Pointer to safely remove it! 21st March 2012 APPEAL FOR VOLUNTEERS: We are looking for volunteers to join our small friendly group who will be able to assist with various tasks that will help us keep to our tight budget. If you can spare the odd hour or two every now and again and would like to see the windmill restored as soon as possible we would love to hear from you. If you are able to help then please contact Jenny Beaupain, Chair of the Friends, on 01892 853161. Or contact us through the website. 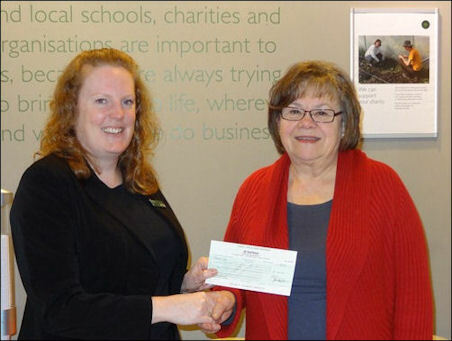 16th February 2012 Argos Hill Windmill Trust has received a cheque for £660 from the John Lewis Community Fund. The photo below shows Jenny Beaupain collecting the cheque on behalf of the trust. 4th January 2012 Argos Hill windmill gets a mention in the Anke blog on Tunbridge Wells windmills! 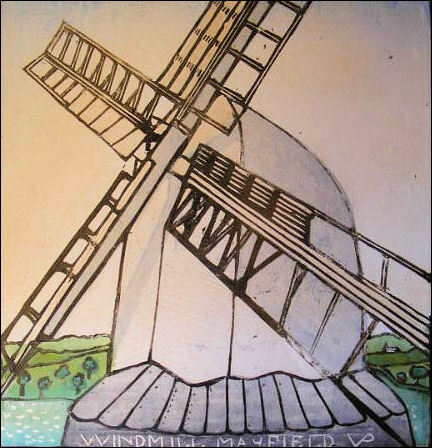 21st December 2011 Argos Hill windmill is featured in the 2012 Mayfield & Five Ashes calendar! The calendar is on sale in Mayfield post office. 25th November 2011 Argos Hill windmill was chosen as one of the three charities to benefit from money raised during the Rotherfield Carnival on 1st October 2011. Very many thanks to Rotherfield & Mark Cross Bonfire Society who presented Argos Hill Windmill Trust with a cheque for £470 at their quiz night last Saturday evening! 15th November 2011 John Lewis in Tunbridge Wells is supporting Argos Hill windmill via its charitable giving scheme, 'Community Matters'. Funding is allocated between three charities based on customer voting. We have been chosen as one of the three charities in the three months leading up to Christmas. If you shop in John Lewis in Tunbridge Wells, please ask for a green token at the checkout to enable you to place a vote! 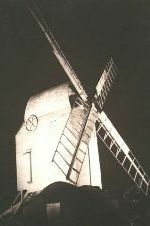 11th November 2011 Mike Somervell has kindly provided a copy of a painting of the mill by Russian artist Vera Popova. It was painted in Vera's studio in Paris in December 1935, after she visited the mill earlier that year. Mayfield church is just visible in the lower right corner. 28th October 2011 Douglas Andrews has kindly provided some fascinating old photographs which show the mill in a poor condition with just three sails. These photos probably date from the early 1950s, and would have been taken before W. Sands of Heathfield carried out the original restoration work in 1955-1956. 1st October 2011 Our Big band evening is now just one week away! Tickets are still available at Rosina's, on Mayfield High Street. £15 including a 2 course supper, admission by ticket only. Saturday 8th October: 7:00pm for 7:30pm at the Memorial Hall, Mayfield. 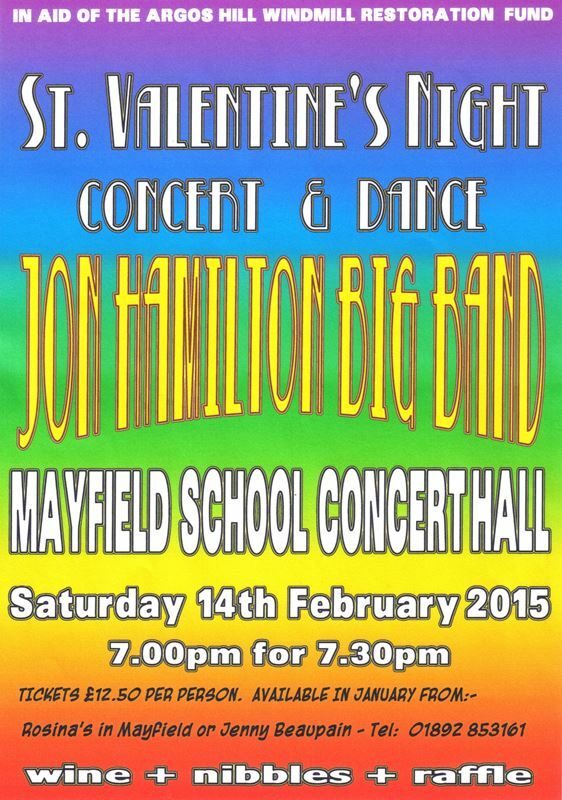 Fabulous 40s - 50s music provided by the Jon Hamilton Big Band consisting of 18 musicians and 2 vocalists. For a vegetarian or gluten-free option telephone Jenny on 01892 853161. Mayfield Village Hall is going to swing on 8th October! 28th September 2011 A reminder that Philip Hicks and Richard Howes will be giving an illustrated talk on Argos Hill Windmill to the Mayfield Local History Society, this Friday (30th September). 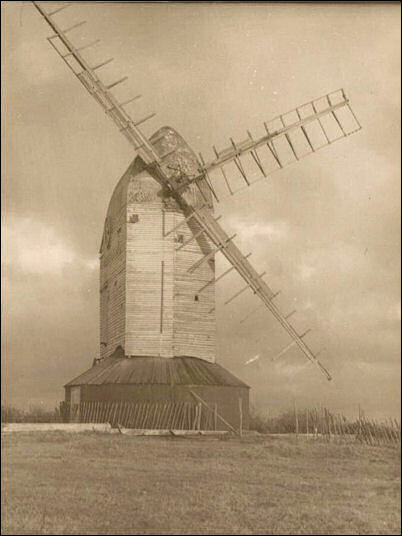 The talk will cover the history of Argos Hill Windmill, it's current state and future plans. 8PM at Mayfield Memorial Hall. It is an open evening so all welcome. Hope to see you there! Donations can also be made by cheque. Please contact us for more details. 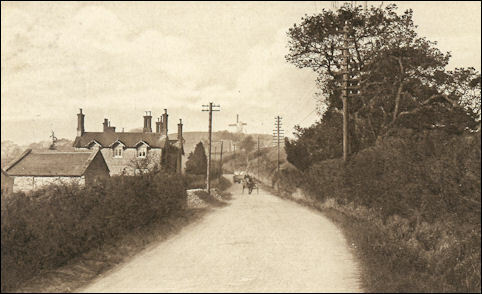 18th September 2011 A very early postcard has been unearthed, showing the mill standing out on the Argos Hill skyline from the Tunbridge Wells road. Do you have any old postcards or photographs of the mill? If so, we'd love to hear from you. Please contact us here. - Saturday 17th September: we will be running a stall at the Mayfield Carnival Street Market to promote the mill. From 12:00 in Mayfield High Street. 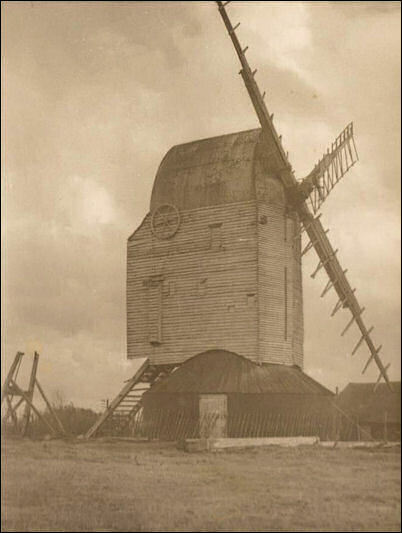 - Friday 30th September: Argos Hill Windmill talk for the Mayfield Local History Society. Philip Hicks and Richard Howes will give a talk on the history of Argos Hill Windmill, it's current state and future plans. 8PM at Mayfield Memorial Hall. It is an open evening so all welcome. - Saturday 8th October: Big band evening with supper. 7:00pm for 7:30pm at the Memorial Hall, Mayfield. Music provided by the Jon Hamilton Big Band. Tickets and the table plan are available at Rosina's, on Mayfield High Street. £15 including a 2 course supper, admission by ticket only. For a vegetarian or gluten-free option telephone Jenny on 01892 853161. Fabulous 40s - 50s music from the Jon Hamilton Big Band, consisting of 18 musicians and 2 vocalists, Mayfield Village Hall is going to swing on 8th October! Please support these events and help raise vital funds for the windmill restoration. 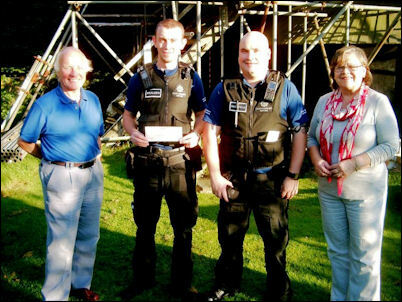 8th September 2011 On 4th September PCSO Matthew Boyle, based at Heathfield Police Station, presented a cheque for £250 to the Argos Hill Windmill Trust Ltd from the Police Property Act Fund. In the photograph, which was taken next to the mill, are trustee Derek Greenwood (in whose garden the mill sits), PCSO Matthew Boyle, PCSO Matthew Neve, and Jenny Beaupain (Chair of the Friends of Argos Hill Windmill). Big band evening with supper. 7:30pm at the Memorial Hall, Mayfield. Music provided by the Jon Hamilton Big Band. Ticket admission only - £15 each (no tickets on the door). Contact Jenny on (01892) 853161 for details. 13th August 2011 The tailpole has been removed from the mill. It was extremely rotten and had almost broken into two pieces. 13th July 2011 Work continues to progress well on site. The decaying timbers of the fantail carriage have now been dismantled. 8th July 2011 A team of volunteers have been working at the mill to remove the badly decaying fantail. It was in a dangerous state, so has been removed for safety reasons. 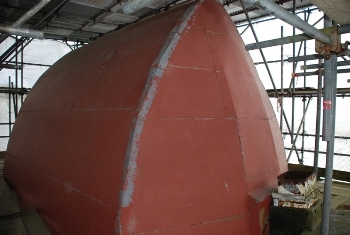 All parts have been retained, to aid with the future restoration of the fantail. - Sunday 4th September: "Walk for the Windmill". A sponsored walk in aid of the windmill restoration, organised by the Mayfield Scouts and Guides. The walk will start at the Scout and Guide Headquarters in Mayfield at 10am and will finish with a barbeque at 1pm. The route is approximately 8 miles for adults and 3 miles for children, taking in the beautiful Wadhurst deer park. Pick up a sponsorship form at Mayfield Post Office. - Saturday 8th October: Big band evening with supper - a fundraising event for Argos Hill Windmill. 7:30pm at the Memorial Hall, Mayfield. Music provided by the Jon Hamilton Big Band. Ticket admission only - £15 each (no tickets on the door). Contact Jenny on (01892) 853161 for details. 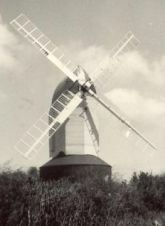 26th April 2011 We are pleased to announce that the Argos Hill Windmill Trust has been granted charitable status. The charity number is 1141597. 1st March 2011 A reminder that BP Award-winning artist Daphne Todd OBE will be at the Mayfield Gallery on 3rd March at 11am, to promote her portrait commission in aid of the windmill restoration fund. 17th February 2011 To kick-start the fundraising campaign, the BP Portrait Award winning artist Daphne Todd OBE has kindly offered to paint a portrait in oils for half her usual fee and give the proceeds to the Argos Hill Windmill Trust. Daphne Todd, the well known Portrait Painter, lives locally and is currently an Ambassador for East Sussex. Daphne recently hit the headlines when she beat over 2000 entrants world-wide to win the prestigious £25,000 BP Portrait Award 2010 at the National Portrait Gallery. Daphne will be exhibiting two portraits in the window of the Mayfield Gallery during March, a wonderful opportunity to see for yourself two splendid examples of her recent work. Daphne has been the Treasurer of the Friends of Argos Hill Windmill since 2007 and is a great supporter of the project to renovate the mill in phases to full working order over the next few years. Daphne has very kindly offered to paint a portrait in oils for half her usual fee and give the proceeds to the Argos Hill Windmill Trust. This is a wonderful opportunity to both commission a family heirloom from an artist at the top of her form and to help our much-loved windmill which has been covered by ugly hording. On March 3rd at 11am Daphne will be at the Mayfield Gallery herself. Full details of her offer can be seen at the Mayfield Gallery during the month of March. 11th February 2011 Fundraising campaign launched! Now that the lease has been signed, we are launching a fundraising campaign to fund the first stages of the mill's restoration. 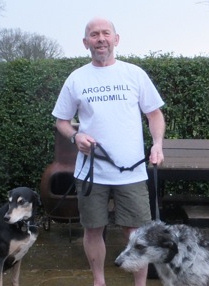 Chairman of the Argos Hill Windmill Trust, Geoff Daughtrey, said: "This year will be make or break for the mill. We are launching a high-profile fundraising campaign with a target of £100K in 2011. 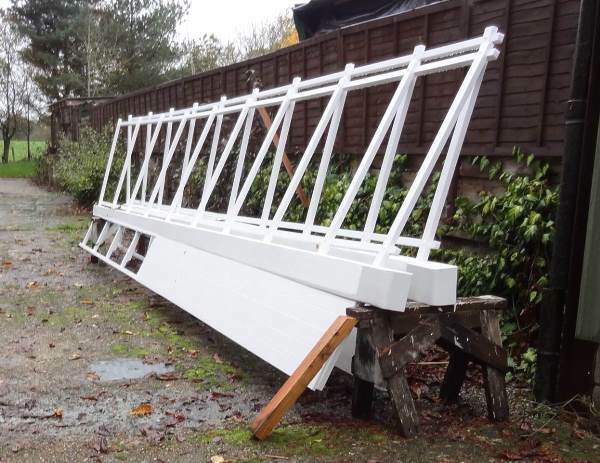 This will enable us to shore up the mill with a temporary steel framework, while the main structural timbers can be repaired or replaced. This is the first phase of an ambitious five year plan." For more details please see the official press release. If you are able to help with the mill's restoration then please Contact Us. Geoff Daughtrey, Argos Hill Windmill Trust Limited, 14-16 Mount Ephraim Road, Tunbridge Wells, Kent. TN1 1EE. "Wealden warmly welcomes the formation of the Argos Hill Windmill Trust. District Councils are called on today to carry out a vast range of duties. 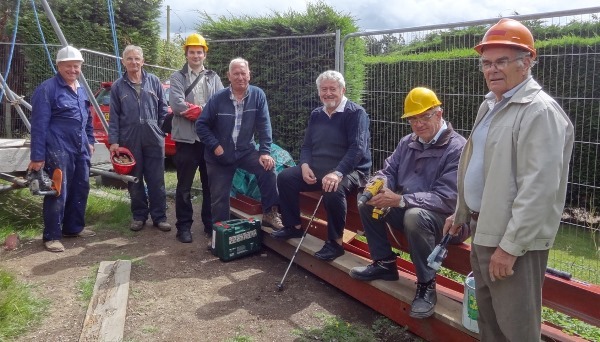 The restoration of such a magnificent wooden post mill is much better in the hands of determined local enthusiasts, and we will be supporting the Trust and its fundraising." 31st January 2011 We will be running a table at the Mayfield "Know Your Village" event on Saturday 12th February. St Dunstan's church, Mayfield. 10:00 - 12:00. All welcome. 7th November 2010 We are now on Facebook! 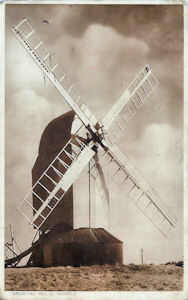 2nd November 2010 One of our committee members recently obtained the following postcard of the windmill. 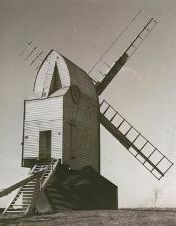 It shows the mill in good condition, probably in the late 1930's or early 1940's, shortly after it ceased work. Do you have any postcards, photos or video footage of the mill? If so, we'd love to hear from you. 24th October 2010 Forty new photos have been added to our Gallery page, showing the mill's current condition. 16th October 2010 We will be running a stall at the Rotherfield Village Hall table top sale, to promote the mill and raise funds. Saturday 30th October, 10am-12am. Free admission. All welcome. 9th October 2010 We now have a Twitter account - @ArgosHillMill. Please follow us for regular updates! 7th October 2010 A new body, the Argos Hill Windmill Trust Ltd, has now been formed. In a Kent & Sussex Courier newspaper article on 1st October, our chairman Geoff Daughtrey said "The trust has been set up, and we are hoping to take a lease of the mill very shortly. 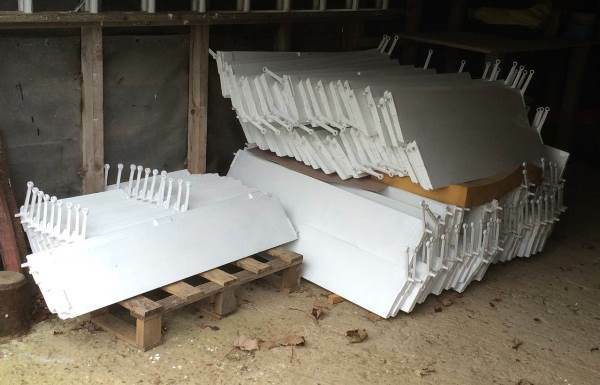 We will then be looking to raise funds in unison with Wealden Council, who are making funds available." 5th Sept 2010 Benn White from Plymouth has kindly supplied some photos of the mill taken in 1937 and 1960. Larger versions of these fascinating images can be seen on our Gallery page. The earlier photos were taken by Benn's grandfather, George Benn White, whose sister, Mary Olive White lived at Argates House (now Post Mill House), just down the road from the mill. 14th May 2010 An article entitled "A brighter outlook for the future of windmill" was featured in the Kent and Sussex Courier newspaper on 14th May. 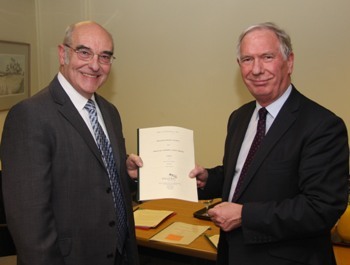 The paper quoted our chairman, Geoff Daughtrey, saying "The future is looking much brighter. This windmill is a local icon and is steeped in history. You can see it for miles around, it is a real landmark. I'm hoping to get a lot of local support to help." 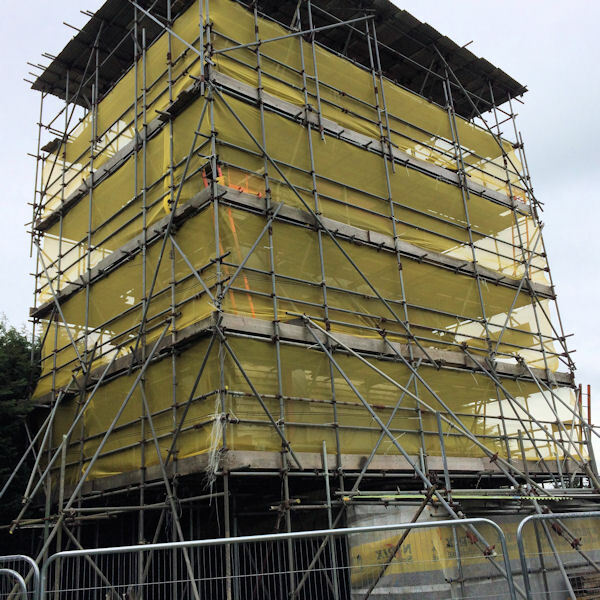 Wealden District Council's director of corporate services, Nigel Hannam, also commented: "The council is very pleased with the progress being made in the setting up of a trust to preserve the Argos Hill windmill and continues to support its formation. We believe a charitable trust offers the most secure future for the protection of this local landmark in the current financial climate." 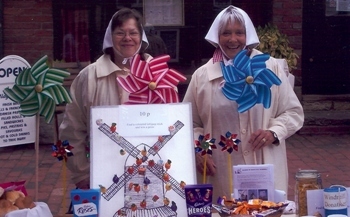 8th May 2010 The Friends Of Argos Hill Windmill ran a stall at the Mayfield May Fair on Saturday 8th May. We distributed our new leaflet and generated a lot of local interest in the mill. The photo below shows two of our committee members, Jenny Beaupain and Judy Emrich, dressed up for the occasion! April 2010 A new body, the Argos Hill Windmill trust, is currently being set up and will soon be taking responsibility for the mill by leasing it from Wealden District Council. April 2010 Argos Hill Windmill website launched!